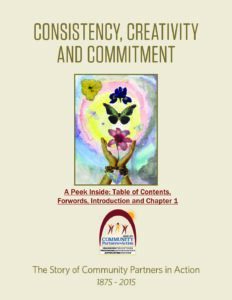 Consistency, Creativity and Commitment: The Story of Community Partners in Action” is CPA’s new pictorial history book. This limited edition tabletop book was written by Gordon S. Bates, CPA Executive Director Emeritus and Historian, and is based on his complete history of CPA, The Connecticut Prison Association and the Search for Reformatory Justice (Wesleyan University Press). The book chronicles CPA’s historic role in the evolution of the Connecticut Criminal Justice System. It is a beautiful keepsake, filled with 90 pages of fascinating stories, quotes, pictures and newspaper excerpts, dating back to our beginnings in 1875. How to Order Your Copy: The CPA History Book can be yours with a gift of $150 or more to CPA. All proceeds will support CPA’s greatest needs, including our mission driven projects and our operational foundation. 1) The Allyn House, location of the first founders’ meeting in 1875. 2) CPA Founding Board members Dr. Joseph Cummings, President, Wesleyan College (lf) and Francis Wayland, Jr, Dean, Yale Law. 3) CPA Founding Board members Charles Dudley Warner, co-owner of the Hartford Courant and The Hon. Nathaniel Shipman, CT State Supreme Court Justice. 4) Mark Twain, good friend of Charles Dudley Warner and adviser to CPA in 1875. 5) Prisoner holding a pig at the Wethersfield State Prison – early Twentieth century. 6) Activist Dortha Bushnell Hillyer, member of CPA Special Committee on Delinquent Women, 1917-1919. Dortha was also the founder of the Bushnell Theater in Hartford. 7) Governor Wilbur Cross; The Hon. William Maltbie, Chief Justice of the CT Supreme Court and CPA President; and Lewis Fox, Esq., CPA board member – 1930’s. 8) Quilt made by staff for CPA’s 125th Anniversary. – 2000. 9) CPA Recreation Services Program Manager Eric Crawford and his son at an anti-drug, anti-violence basketball clinic sponsored by CPA – 2001. 10) “Hope”, a mural created by Adalberto Rodriguez, a former CPA client, at the Hartford Alternative in the Community Program on Windsor St. – 2011. 11) Residents of Mart’s House, a reentry transitional house for women – 2016.